Friendship is a funny thing, don’t you think so? I love my friends dearly and couldn’t ask for more from them. I say this because recently I lost a very close friend of mine…my oven (yes, I’m that big of a food dork). Considering the age of my oven I shouldn’t be surprised. Thankfully my oven death is actually more of an oven coma; the baking element needs replaced. This wouldn’t have bothered me so much but I do bake quite a few of our home meals. This week’s recipe was going to be a really REALLY good macaroni and cheese recipe, just in time for Thanksgiving. The temporary death of my oven stopped that recipe in its tracks. Instead of makin’ some mac this week, I decided to celebrate a new friendship by trying my hand at a Chinese tea egg recipe. My fiance and I have recently developed a friendship with the owners of a local Chinese restaurant. They’re some really sweet folks and have given us the most awesome food (nai wong bao) and delicious teas straight from China. To return the favor I baked orange cupcakes about a week ago. Our new friends accepted them but later told us that they were too sweet for their taste, something I can completely understand. Instead of trying another dessert I decided on the tea eggs! 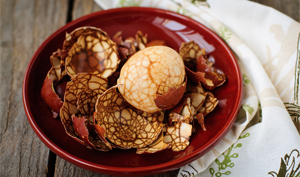 Tea eggs are a very popular snack food in China and can often be found for sale on the streets. This recipe also usually contains an ingredient not found where I live: Star anise. I improvised by adding Chinese 5 spice to the recipe (it contains a lot of anise) to achieve the flavor. After making these eggs and letting my Chinese friends taste them I learned that my recipe had the correct flavor but it needed to be stronger. I’m encouraging you to add at least 4 more tea bags to the recipe as well as 4-6 tablespoons of DARK soy (found at Asian markets OR online). It wouldn’t hurt to add more salt, either. Below is the recipe with a few changes made. The video explains the process and shows the first recipe. 8. Let simmer for at least 2 hours if not more! I may have not made the eggs strong enough compared to the real deal back in China but our new friends seemed to really enjoy them anyway. I can’t explain what kind of giddy excitement came over me when I handed the eggs over but it seemed to be contagious. Our new friends were so excited just to see the common Chinese snack that they wanted to eat them right away! Joy like that just made my fiancé and I even happier. Try the revised recipe out! I’ll be making them again soon too, just to see the flavor difference. I bet the marbling will look a lot darker with this recipe too! Any who, I hope all you foodies out there have a great weekend and REMEMBER: Thanksgiving is running up on us pretty quick!